CLEARWATER (Jan. 29, 2019) – The black stretch limo turned the corner into Plumb Elementary School’s parking lot shortly after 8 a.m. Tuesday. And as it inched into view in a lane normally reserved for mundane morning drop-offs, the throng of children, teachers and staff erupted in boisterous cheers befitting the sighting of a Hollywood superstar. Nicole Kenngott, the newly named 2018-19 Pinellas County Schools Teacher of the Year, accompanied by her 3-year-old son Jack, peering out the limo window, might just as well have been walking on air than arriving in a sleek set of wheels. The red carpet that had been used the night before inside a sold-out Mahaffey Theater at the annual Evening of Excellence – hosted and produced by the Pinellas Education Foundation and made possible by presenting sponsor Aetna – was rolled out once again on Plumb’s sidewalk in honor of Kenngott. 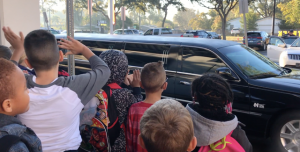 And after stepping out of the limo and being introduced by her proud principal, Holly Del Duca, the 33-year-old fifth-grade teacher was mobbed by excited students and hugged by colleagues. “There is no profession like the teacher tribe,” she said, eyes tearing amid a greeting that visibly overwhelmed her. It was the same feeling she experienced only 12 hours earlier when her name was called as Teacher of the Year and, with student presenter Lilly Crandall holding her hand, she crossed the stage with emotions swirling and accepted congratulations from PCS Superintendent Dr. Michael Grego and others. Kenngott was one of 128 nominees and made it to the final 10, chosen by a panel of judges based on multiple criteria – then chosen as the overall winner by a different group of judges in a second round of scoring. Kenngott, who has a specialty in deaf studies and a master’s degree in the study of autism, began teaching a decade ago in New York working with deaf and autistic high school students. She began teaching in Pinellas at Sandy Lane Elementary and has spent the past three years at Plumb, where, in addition to teaching fifth graders, she hosts an American Sign Language Club and serves as both a teacher and student mentor. The other Teacher of the Year finalists included: Andrea Anderson (St. Petersburg High); Karen Bulino (Seminole Middle); Michelle Hajian (High Point Elementary); Angela Johnson-Drummond (McMullen-Booth Elementary); Lauren Iovino (Boca Ciega High); Autumn Lunin (Safety Harbor Middle); Emily Maker (North Shore Elementary); Candace Reed (Azalea Elementary); and Wendy Stryker (Safety Harbor Middle). In addition, Reed, a second-grade teacher at Azalea, was selected as Fan Favorite in a contest conducted over the past month on the Pinellas Education Foundation’s Facebook page. For votes to count, members of the community had to “like” both their favorite teacher and the Pinellas Education Foundation page. 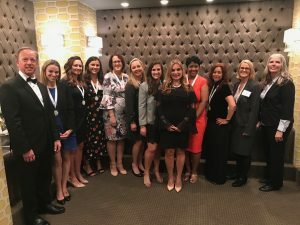 Left to right: Dr. Grego, Nicole Kenngott, Lauren Iovino, Emily Maker, Wendy Stryker, Andrea Anderson, Michelle Hajian, presenting sponsor Aetna’s Cathy Aguirre, Candace Reed, Karen Bulino, Autumn Lunin, and Angela Johnson-Drummond. “We are honored to produce this event each year as we pay tribute to the teaching profession and all who stand before their classrooms each day dedicating their lives to our children and helping ensure they receive the best education we can possibly give them,” said Pinellas Education Foundation chairman Doug Bishop. His words exemplifed a night filled with highlights – among them the standout emcee work by Tampa Bay Rays’ original broadcaster Dewayne Staats, who stirred the crowd early on by talking about the powerful influence public education had in his own life; a message of appreciation from St. Petersburg Mayor Rick Kriseman; the earnest, heartfelt speeches of the 10 student presenters who introduced their teachers; the stellar performances by the Tarpon Springs High Jazz Ensemble that gave the event the feel of a major TV awards show; and Palm Harbor University High School student Chris Loving, along with a group of talented students and educators, performing the Broadway tune, Be a Hero. 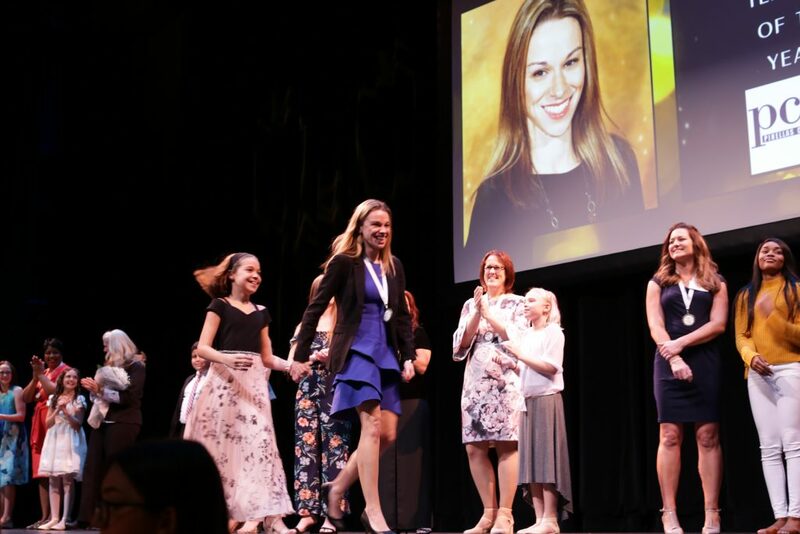 It was a display of drama, gratitude and emotion that lasted until Tuesday morning, when the Teacher of the Year savored the memory of a lifetime with an adoring crowd. And then she got back to doing what she loves most – teaching. For a downloadable, designed PDF of this story with more pictures and a photo gallery click here.